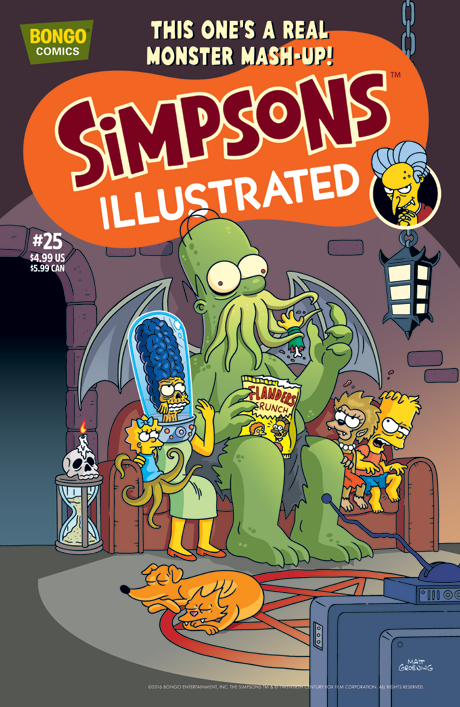 After being sentenced to serve detention in the old library in the subterranean bowels at Springfield Elementary, Bart discovers The Book of the Dead and accidentally unleashes the Cthulhu on an unsuspecting Springfield. Then, Homer and Bart must protect the nuclear power plant from a zombie invasion. And as if one ghostly book wasn’t enough, Bart comes into possession of an evil journal that spells doom for anyone whose name is written into it. Purchase this diabolical comic at your own risk!